In the last few months, quite a few folks around pub-media-land have asked me if there is any updated data on salaries in public media newsrooms. I wish there was. If you know of any fresh surveys, let me know. In the following three charts, the data is sorted by news budget size. You may recall from the 2010 survey (in which Steve Martin, Ken Mills and I questioned more than 300 station managers about their local newsroom staffing and programming), that the most significant variable in salary data was the news budget itself. This was more telling than such factors as station type (radio, TV or Joint), or licensee (community, university), or even market size. In the 2010 report, I used a data visualization technique to indicate the sample size for each column of data. The sample size is good to know, of course, because a sample size of 30 is a much stronger index than a sample of 2. I didn’t do that technique here, but below are tables indicating the number of stations that provided the salary data for each job title (per each chart). Remember, this isn’t the number of people in those jobs, it’s the number of stations reporting their salary for that job title. Finally, we’d all agree that much has changed in #pubmedia between 2010 and 2015, so this adjusted estimate of salaries does not provide a snapshot of what’s actually going on out there. Many stations have been investing in local news and may have changed budget categories, or increased salaries, or — as we know — have begun creating entirely new jobs to manage digital projects and audience engagement. If anyone wants to talk about a more refined look at this data, let me know. Better yet, if anyone wants to sponsor a fresh salary survey, I’m game for that, too! The survey we’ve been unpacking here for the past few weeks still has more to offer! In this series, we reveal what we found about the amount of airtime that was devoted to local news and public affairs in an average week during 2010 on public radio stations in the United States. At the bottom of the page, we offer an educated guess on what this adds up to per year. The chart below shows the distribution of our sample per airtime category. 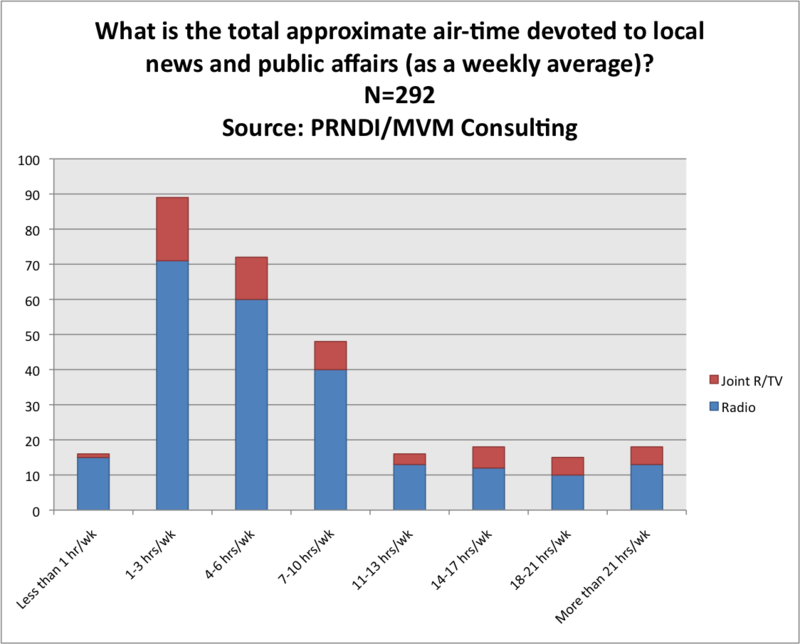 It is quickly apparent that the bulk of stations (72%) are devoting between 1 to 10 hours per week on-air to local news. The largest single share is in the 1-3 hours per week category. Followed by the 4-6 hours per week group. Another 22% of public radio stations go further, committing well in excess of 11 hours per week to local news programming. Only 6% offer less than an hour per week of local news. We didn’t separate weekday programming from weekends, but we can say from observation and experience that the vast majority of the local news time reported here would be during the five day work week. This means the bulk of local public radio stations are offering roughly 30 to 120 minutes of local news per day. And some heavy hitters are providing around 4 hours per day. The next chart shows the same data but in real numbers rather than percentages. It also separates out those stations that are radio only from those that are shared with a television station (the joint licensees). 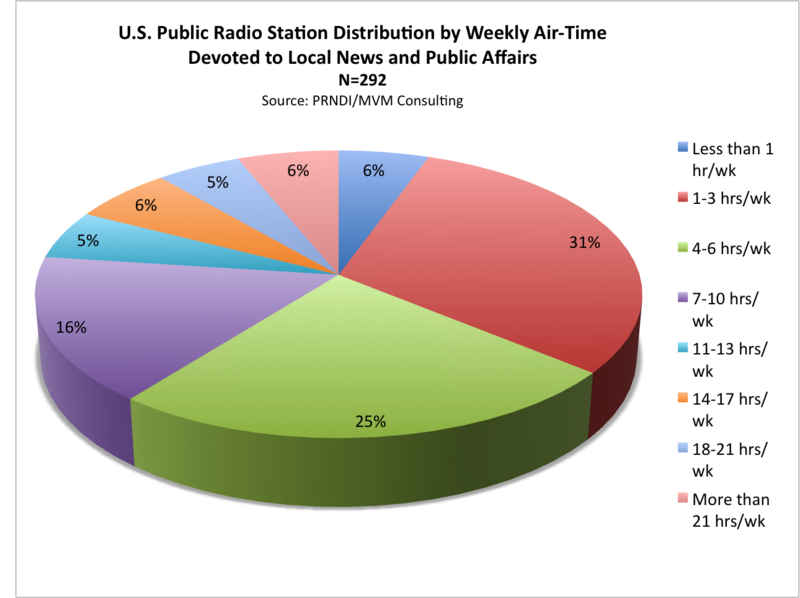 This chart shows the predominance of stand alone radio stations in providing the bulk of local news minutes, especially in comparison to the joint licensees. However, it also shows that joint licensees (with their larger service missions of both radio and television platforms) tend to make up a larger share of those columns toward the right side of the graph — the stations devoting greater airtime to local news and public affairs. To slice things a bit further, we did a cross-tab by annual news budget size. The news budgets were reported earlier but now we can see how they may relate to the amount of airtime committed to local news. The following chart takes all the respondents and sorts them into 8 budget categories — the eight colorful columns. The smallest budgeted newsrooms are in the column on the left. The largest budgeted newsrooms are on the right. For each column, there are color coded segments that correspond to the legend — sorting the stations by average weekly airtime allotted to local news. The number inside each color segment shows the actual number of stations. 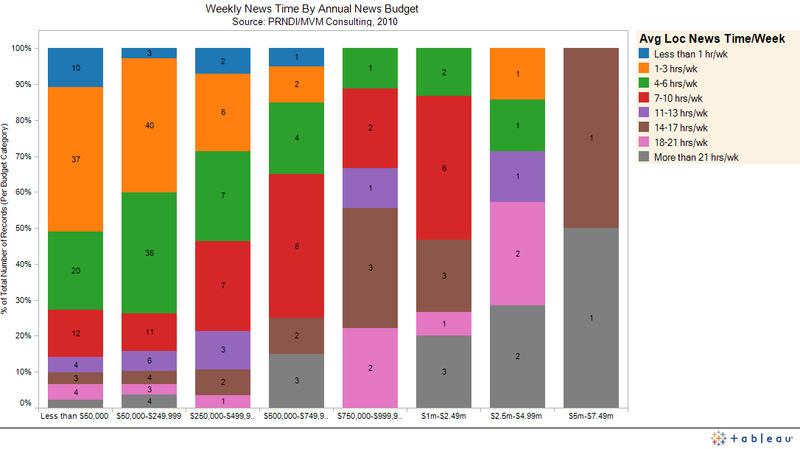 This allows you to find your station according to news budget size… and then see where you compare in terms of weekly news time. Granted this chart got a little squished in the translation (click on it to see it more clearly). But essentially what it shows is that as the stations invest more money in news, they report greater amounts of airtime devoted to news. This can be seen easily in the color progression from left to right. The blue, orange and green segments generally diminish while the red, purple, brown, lavender and gray segments generally increase. Of course, the numbers of stations are still largely concentrated in the lesser budget columns and in the more modest airtime segments. While this tells us nothing of the quality of the programming, the correlation between budget resources and programming time indicates a quality connection. The good news is that stations seem to be striving for quality relative to staffing and budgeting — thus you should see less quantity among those stations on the left of the graph… and those on the left airing many hours per day raise some suspicion about their quality. Bottom Line: Over 100,000 Hours Per Year! For our sample, then, we arrive at just under 2000 hours per week of original local news programming on U.S. public radio. Or about 400 hours per day. That scales to roughly 100,000 hours per year based on 50-weeks of output. This seems to be a handy number and rather conservative too — considering the sample is roughly 80% of the actual public radio universe in the United States. FYI — earlier we reported on the news programming trends showing a third of stations plan to increase their news time commitment this year. A direct-invitation survey was conducted between July 26 and August 15, 2010 by Michael Marcotte of MVM Consulting with help from Steve Martin of SFM Consulting and Ken Mills of the Ken Mills Agency. This survey was conducted as a supplement to a CPB/PRNDI census of local public broadcasting journalists. (Download a copy of the survey.) Ninty-two percent of all CPB-qualified public broadcast organizations took part in the main survey, and about 80% of those went on to complete the supplemental (or about 380 stations). The section reported here combines the radio and joint licensees, and leaves out the TV respondents. I’ve sorted the average annual salaries in public radio newsrooms by their station news budgets. As you would expect, the higher budget categories closely correlate with higher average salaries. If you look under “news directors,” for example, you’ll see that stations spending between $500k-$1m a year on their newsrooms, spend an average of $60k-$65k for news director salaries. Again, this is based on a survey of almost 400 U.S. public broadcast station managers last summer. The thicker the line in each of these graphs, the more the number of stations contributing to the average. Click on the graph to see it larger. Refer back to the earlier salary charts to see highs, lows, medians, averages and actual station counts per each job title. The thickness of the pink line attests to the many stations in that $50k-$250k newsroom budget bracket. The news directors at these stations share an average annual salary in the low 40s. There is a jump, however, in the newsroom budget brackets above $250k. The managers of these bigger newsrooms are averaging between the mid 50s to the mid 60s. Again, we see the thick pink line due to the many stations in that lower budget bracket. Hosts at those stations get paid in the low 30s on average. The newsrooms above $250k push the average pay up over $45k a year. The trend lines for reporters are obvious — more pay at bigger shops — though the upper range of averages is only in the upper 50s. Public radio news producers show average annual pay rates quite comparable to reporters relative to their respective newsroom budgets. Note the larger scale range used to display the VP of News average annual salaries. This position is more common in the larger stations. The Executive Director/Producer chart shows this position can be found in smaller stations, but the pay still scales according to budget. Senior producers are averaging salaries just below those of news directors in the larger stations. The assistant news director chart has enough random deviation in the small sample to limit its usefulness. There are few of these in the sample to begin with, so the green line is an outlier (part-time position, most likely). Similarly, the deviation from the normal curve may also be due to the newness of this job title and the likelihood it represents different jobs in different stations. Again, jobs that focus exclusively online are still relatively rare in public radio (it is far more common to find hybrid positions mixing broadcast with new platforms), yet despite the smaller sample size, we can see patterns emerging in online editor and web producer average salaries. 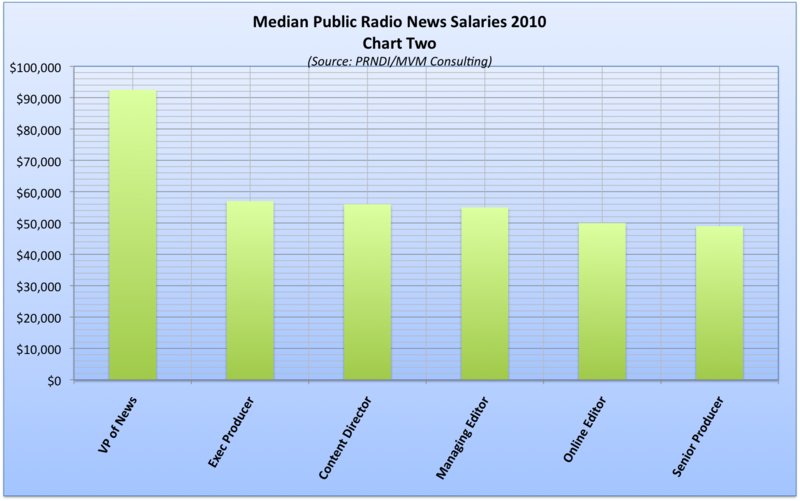 New data from a 2010 local public radio station survey shows the median news reporter salary under $37,000 per year. The median for news hosts was $40,000. The median for news directors was $45,000. The overall highest paid position was vice-president of news with a median of $92,500. The lowest median salary was $32,000 for assignment editor. The data show vast differences between individuals performing the same job at different stations. For example, the lowest paid content director earns $128,000 less than the highest paid content director. The most common jobs in local public radio newsrooms are news directors, reporters, hosts and producers. The survey was conducted by myself with help from Steve Martin and Ken Mills during July-August 2010. Over 300 stations participated. The survey was a supplement to the PRNDI/CPB census of journalists which has yet to be released by CPB. 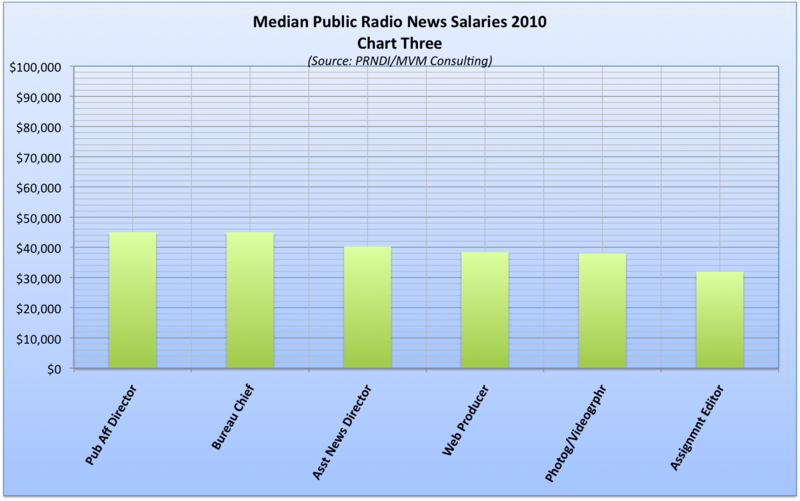 This is the first comprehensive public radio news salary survey that we know of. As such, we do not have trend data. However, we can make some salient comparison using data gathered by Dr. Bob Papper of Hofstra University who conducts an annual newsroom survey for RTDNA. Dr. Papper includes both commercial and non-commerical broadcasters in his survey, though, in general, his data are viewed as a snapshot of commercial newsrooms. As one can see, public radio stations show a wider range of high and low pay rates for news directors, reporters and anchors. 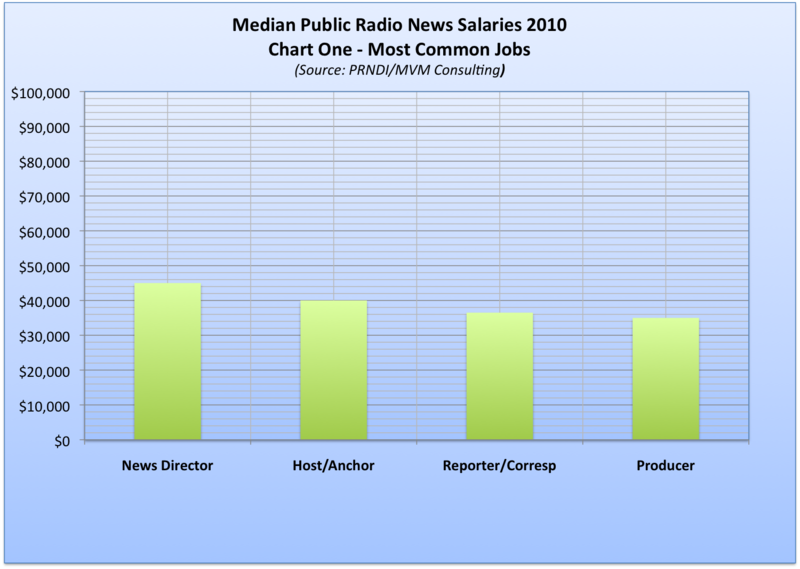 Somewhat encouragingly, public radio newsrooms show overall higher median pay rates for those positions. Our survey of U.S. public radio stations in 2010 found that 90% had news budgets under $1-million, and 70% spent less than $250-thousand on news. The sample of 288 stations spent between $77-million and $168-million on public radio news programming. 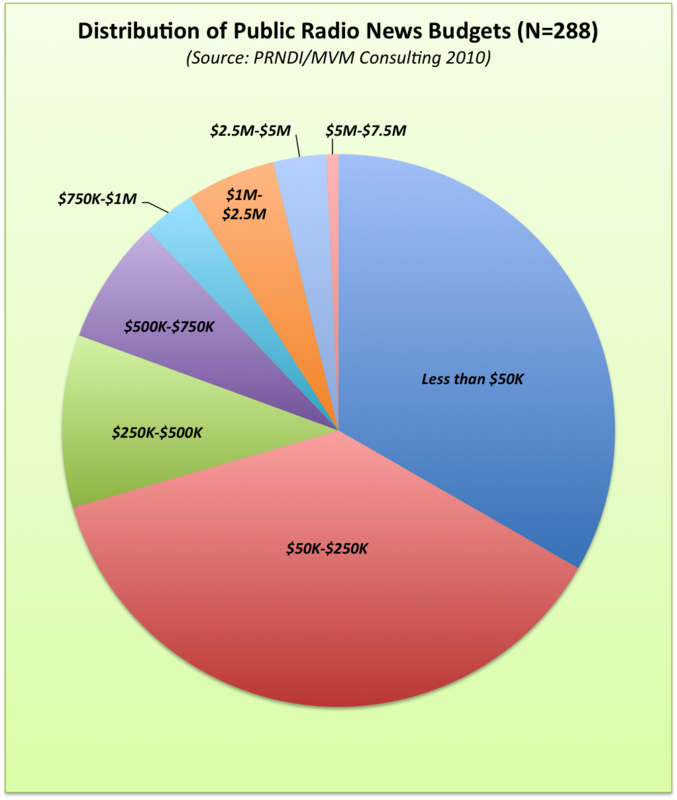 As the chart shows, the single largest news budget bracket was $50K-$250K (37% of stations). Survey Question: Approximately, what is the dollar range of your total budget for local news and public affairs in FY 2010? Typically the lion’s share of spending in a newsroom is for personnel. For illustration purposes, we multiplied the number of stations per bracket by the low and high end of the dollar ranges so we could see what the range of actual spending was for this sample. It showed actual spending between $77-million and $168-million. 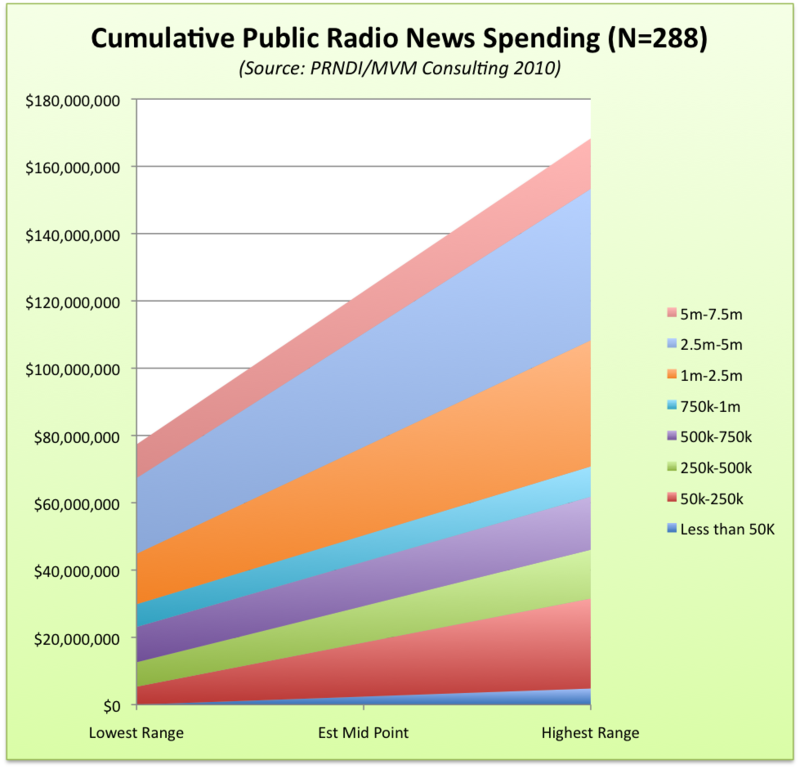 This chart shows how the overall spending on news is not carried out by the many stations at the lower dollar amounts. Rather, the lion’s share of news spending is generated by fewer stations in the larger brackets.